Check out some of the best soccer dribbling and footwork drills from experts in the game. To become a high level soccer player you'll need to have exceptional soccer skills - and that means having the ability to control the soccer ball with every part of your foot. 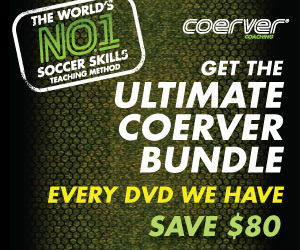 These moves and footwork skills are based on the Coerver Coaching method. 1. Inside Roll -- Roll the ball across your body from outside to inside with the inside and sole of the foot and stop the ball with the inside of the other foot. 14. Stepover Turn -- Push ball forward, step over ball with one foot, turn toward ball and take it in the opposite direction. 16. Scissors -- Starting with the ball to one side, step over or in front of ball so that the ball ends up on the other side of you. Take theball in the opposite direction with the outside of the other foot and then stop ball with the sole of the first foot. 1. Hip Swivel -- Fake with inside of one foot by swivelling hips toward ball, then reverse direction and take the ball with the inside of the other foot. 3. Cap -- Cut ball with inside of foot slightly backward and take ball ahead with the inside of the opposite foot. 4. Stepover -- With ball moving, stepover ball so ball is outside of stepover foot, turn and take the ball with the other foot. 5. Scissors over ball -- Step behind ball as if preparing to take it with the outside of one foot, then step over the ball and take it with the outside of the other foot. 6. Rivelino -- Same as stepover, but take the ball with outside of stepover foot. 7. Vee -- Fake pass with instep (across body), pull ball back with sole and take in opposite direction with the inside of the same foot. 8. Cruyff -- Fake kick with inside of foot, but instead pull ball behind the standing leg and change directions. 9. Inside of foot cut -- Cut the ball across body with inside of foot while simultaneously stepping over it and take with outside of opposite foot. 13. Scissors in front of ball -- Step behind ball as if preparing to take it with outside of one foot, then step around front of ball and take it with outside ofthe other foot. 16. Stepover - Scissors -- Ball rolling. Stepover followed by scissors with same foot and take with outside of other foot. 17. Front Roll -- While moving forward, pull ball across body with sole and take with outside of opposite foot. Complete Seven Minute drill is more than 575 touches on the ball. Spend another ten minutes passing against a wall, both feet, both one and two-touch, instep and inside of feet, include fake kicks. Keep feet moving and work on accuracy. Spend ten minutes juggling the ball trying to get 100 consecutive juggles. Do 50 to 100 situps, then stretch. Try to do complete workout every day. This workout can be done anywhere that there is little danger of breaking things, for instance in a basement, playroom or outside. 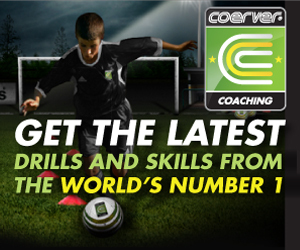 Learn more about Coerver Coaching methods and training ideas here. Note: the following collection of footwork and dribbling moves was put together by Dennis Mueller, a boys' U16 competitive coach in Princeton, NJ (USA) from the tapes by Wiel Coerver (1-2-3-Goal, Coerver Coaching), Frans van Balkom (On the Attack), Hubert Vogelsinger (Videocoach Vogelsinger) and Dario Gradi (Soccer Skills for the 90s) (these tapes are available from various vendors).